Bags are labeled and color coded to corresponding micron rating: Purple-25 micron, Yellow-73 micron, Orange-120 micron, Red-160 micron, Blue-220 micron and a 20*20 pressing screen-25 micron. For using with 5-gallon buckets or tubs. 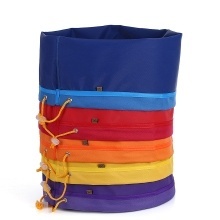 Made of durable waterproof coated nylon material, with built-in flexible cord for binding the filled bag. The bag set including 5pcs of 5 gallon filter bags. Includes a storage bag to keep them organized and clean when not in use. Works well in extracting the oil from any herbs.